Background: Antimicrobial drug resistance is an emerging problem, which leads to a failure in the control of infectious diseases thereby, adversely affecting patient care and reducing effective management of infectious diseases globally. Thus, search for new and more effective alternatives is needed. Daphne retusa Hemsl. (Daphne) has medicinal values and is reported to be widely used in curing a variety of human ailments. Objective: Current study assesses in-vitro antimicrobial activity of the crude extract of D.retusa (whole plant) and its derived fractions against clinically isolated human pathogenic bacteria and fungi. Materials and Methods: Whole plant of D.retusa was powder dried and then extracted with methanol (E1). The resultant was fractionated to give Chloroform fraction (E2), Butanol fraction (E3) and Ethyl acetate fraction (E4). The crude extract and derived fractions were assessed for antimicrobial and antifungal activity by using agar well diffusion method and their MICs were found following Clinical and Laboratory Standard Institute (CLSI) guidelines. Result: Our study shows that D.retusa has very good inhibitory action against different bacterial and fungal strains. All of the extracts were active against almost every microorganism used in the study. E2 has the maximum percent of inhibition against bacterial growth while E1 has themaximum percent of inhibition against fungal growth. 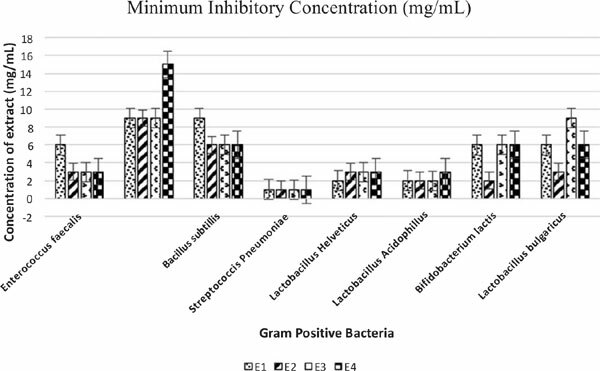 Streptococcus pneumonia was the most susceptible bacteria while among fungi, Gongronella butleri showed highest susceptibility. Conclusion: Results justify the use of D. retusa in the treatment of microbial infections. For the development of a novel antibiotic, the crude extract and its derived fractions need further exploration; with emphasis to isolate and identify the active constituents that are responsible for antibacterial and antifungal activity. Keywords: MIC, Agar well diffusion method, CLSI Guideline, D. retusa, Gongronella butleri, Bacteria and Fungi. Keywords:MIC, Agar well diffusion method, CLSI Guideline, D. retusa, Gongronella butleri, Bacteria and Fungi. Abstract:Background: Antimicrobial drug resistance is an emerging problem, which leads to a failure in the control of infectious diseases thereby, adversely affecting patient care and reducing effective management of infectious diseases globally. Thus, search for new and more effective alternatives is needed. Daphne retusa Hemsl. (Daphne) has medicinal values and is reported to be widely used in curing a variety of human ailments.